Recently, I decided to head to Sydney's vibrant ferry terminal at Circular Quay. I didn't drive or take the train or a ferry. I walked from my home in Liverpool. It took me seven hours to traverse the 40 or so kilometres. You might not be surprised that a few people have asked "Why did you do that for?" Well, why does anyone do anything? Like many a mountain climber has said; "because it was there". But this article is not about me or how sore and tired I was by the end of my epic walk. No, this is about what I discovered along the way. 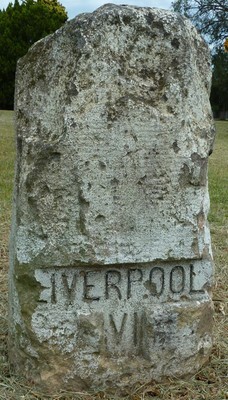 Convict carved milestones. Long before GPS's and long before the large green street signs you see today stating distances to various destinations, convict labour chipped away at sandstone blocks to place on this newly hewn road in the colony of New South Wales. It wasn't long into my journey before I stumble upon the first of the milestones that still dot the Hume Highway, relics of the old Liverpool Road. I wondered how long these milestones had remained in place. 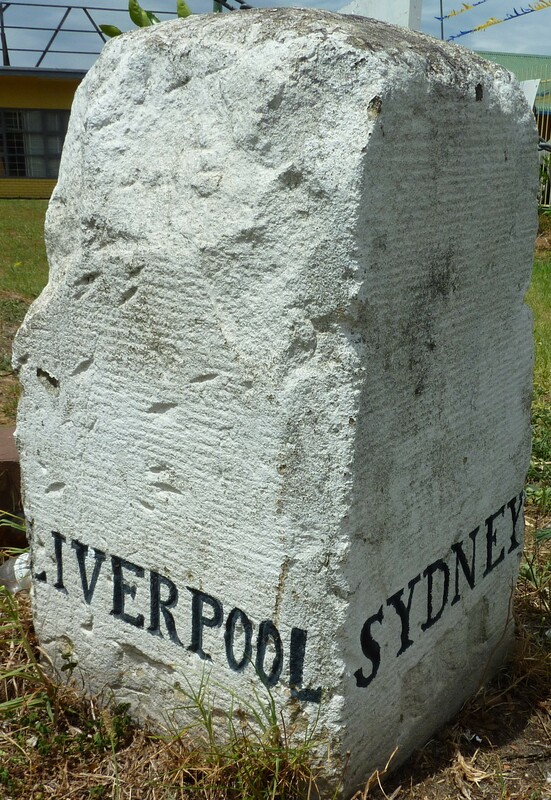 When was the road from Sydney to Liverpool constructed? I text my better half asking her to research the history of the Liverpool road while I trudge along on my marathon walk. I pass another milestone, this one a 1930's concrete peg at Lansvale just before reaching the historic bridge. I've crossed it many times in a car without really admiring it. But this morning I can appreciate its sandstone construction as the early morning light reflects a brilliant hue. I have the time and opportunity to read the plate embedded in the bridge. Opened in 1836 and designed by David Lennox, the bridge utilised nearly 1000 convict labourers in its construction. As I pass through the iconic Meccano lights, I receive the first of many texts informing me of the Liverpool road's history. The contract to build the Liverpool road was awarded to an ex-convict named William Roberts in 1813. It was to be completed within 12 months. Can you imagine any road being completed within 12 months these days? The contract stipulated that the road shall be "thirty three feet wide with three rods of ground on either side felled' and that it was to include 'all bridges necessary to be erected thereon, whether the said bridges be big or small'. The milestones were erected later in 1816. 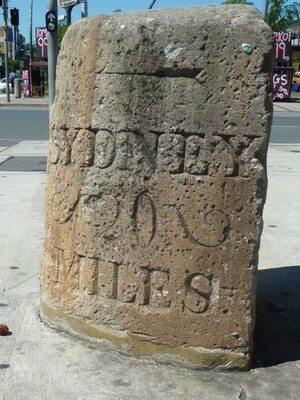 Some milestones have since gone missing or damaged and were replaced by concrete 'pegs' in the 1930's. I pass several more 'pegs' but just past Ashfield, I pass what was to be the last milestone. 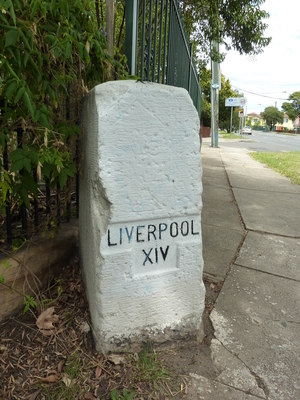 In freshly painted Roman numerals it boldly displays seven miles to Sydney. Then I realise something very odd. The other side of the milestone says 14 miles to Liverpool. That totals 21. Is it 20 or 21 miles between the two cities? There's no one around to discuss this anomaly. Upon reaching Parramatta road, I begin to feel like a marathoner might feel 'hitting the wall'. I start to feel weary. I then begin to feel strangely self conscious. I pass thousands of people who don't have a clue what I'm up to. Nobody asks me what I am doing, or congratulates me on my achievement. Is it necessary for me to wear a 'I am walking from Liverpool to Sydney' T-shirt and hat and a support vehicle to attract attention? Maybe I'm becoming a little dehydrated. I take a big swig of water. I reach Macquarie Place in Bridge Street and with some relief admire the Macquarie Obelisk. It states 20 miles to Liverpool. Not 21. I ask a group of passing American tourists to take a photo of me to prove that I completed the journey. I tell them of my day's adventure and they look a little bemused and confused. "Why did you do that for"? "Because" I say, "It was there". In South Strathfield there is an almost halfway milestone "L 11 S 10" at Weston's Mill at 1 Braidwood St/644 Hume Highway on the south side of Liverpool Rd/Hume Highway at the corner of Centenary Drive. Further west at Chullora's Palms Hotel at 167 Hume Highway, there is an almost illegible milestone. Can anybody calculate what the mileage would be there? Would it be L 10 S 11? At Bankstown's 204 Hume Highway, "L 9 S 12"
Year of this concrete milestone's construction? A great pedestrian achievement. Look up the Flying Pieman who walked from Sydney to Parramatta twice a day for 6 days inth 1840's. 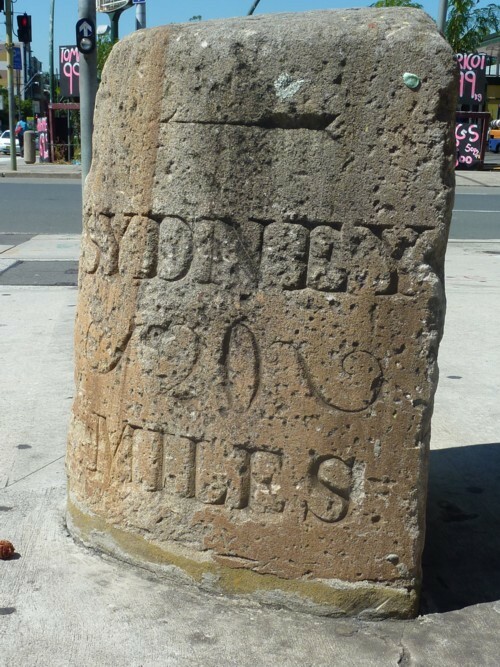 There are many more milestones lining Sydney's roads. Chullora's corner of Muir Rd at the Palms Hotel. There are also two small recessed squares. Something is probably missing from there. What would have been there? Maybe the words: Liverpool, and Sydney? Absolutely brilliant... To date the only Weekend Notes I've read from start to finish. What an interesting person you are and well done for living life rather than coaxing through. More of these stories please! What a great achievement, well done Glenop. Its lovely to see the old milestone still existing in a modern environment, abit like the odd horse troughs that are still around.